“It’s neither the first nor the last,” said Leslie Crutchfield, author and Executive Director of the Georgetown University Global Social Enterprise Initiative (GSEI). “Rather, it’s the collective weight of all the snowflakes that breaks the branch.” During the closing plenary, Crutchfield used this analogy to urge philanthropists to fund movements, not just programs. According to her research, movements only last when they have bottom-up support from a variety of different groups. For example, the successful movement to reduce smoking in the U.S. did not have one leader in particular. Rather, a groundswell of philanthropic leaders, citizen activists, lawyers, and others came together to push the movement forward—thus “breaking the branch” together. Philanthropies such as the Robert Wood Johnson Foundation played a crucial role in this movement, yet they alone cannot claim credit for its success. “There’s often ego involved in philanthropic funding,” Crutchfield remarked, “but funding movements doesn’t give you credit because you can’t attribute success to yourself.” For funders who are willing to forgo such credit, funding the “backbone” of movements can facilitate the involvement of the multiple stakeholders needed to make strong, lasting change. During Women and the Future of Impact Investing, Lauren Booker Allen described how Omidyar Network seeks to bring more funders—and their capital—into the space of impact investing. As Senior Manager of Impact Investing, Allen helps Omidyar build market infrastructure. “We’re doing the plumbing for the industry to catalyze more investments in this space,” she explained. This “plumbing,” or field-building work, includes creating a network of thought leaders and spreading knowledge of how best to engage in impact investing. In particular, Allen has seen demand from female and millennial investors change the field for the better. She encourages women especially to take control of their assets and seek out financial advisors who can help them achieve both financial and social returns. “We’re seeing a lot of paralysis, or hesitancy to act,” she said. 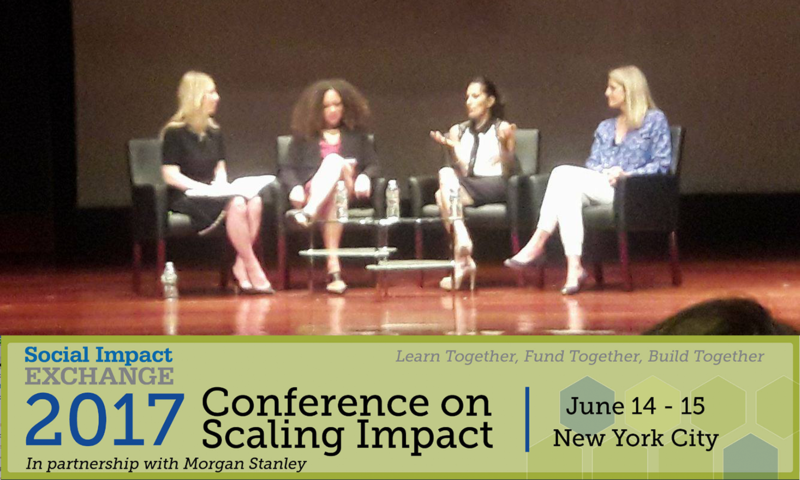 “But I encourage you to be bold.” Fellow panelist Sukhinder Singh Cassidy, Founder of theBoardlist, closed with additional practical advice. “Even if you don’t have financial capital to invest, you can invest intellectual capital,” she suggested. “Volunteer, be an advisor, join a board, etc. Or, you can invest small amounts of money to get experience. Don’t be afraid to take more risks and learn early by investing in things with low ticket sizes.” Better to start small than not at all! Thank you to Social Impact Exchange for hosting. We’re looking forward to next year’s conference!